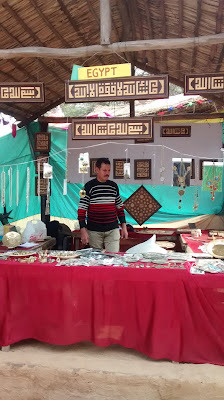 Surajkund International Crafts Fair is held in the first fortnight of February every year in Surajkund, Faridabad, near Delhi, the capital of India. Hi friends! Hope you all are doing very fine. 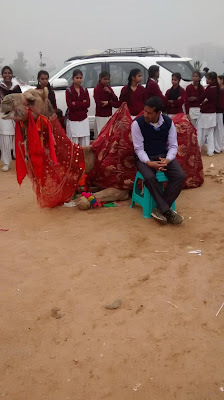 Welcome back to my blog, bringing to you the most amazing places to see in India. Well, I am excited to report that I have been able to tick one of the five amazing places, I listed in my bucket list for 2019, which I had mentioned in one of my earlier posts this year. 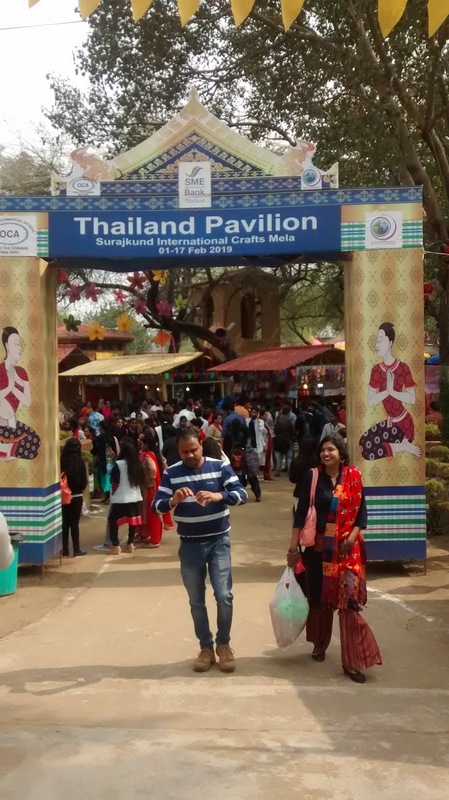 I am here to share with you all, my trip to Surajkund International Crafts Fair 2019. Surajkund International Crafts Fair boasts of being the largest crafts fair in the world. This fair is held to celebrate and bring out the best works from craftsmen from India and the rest of the world. 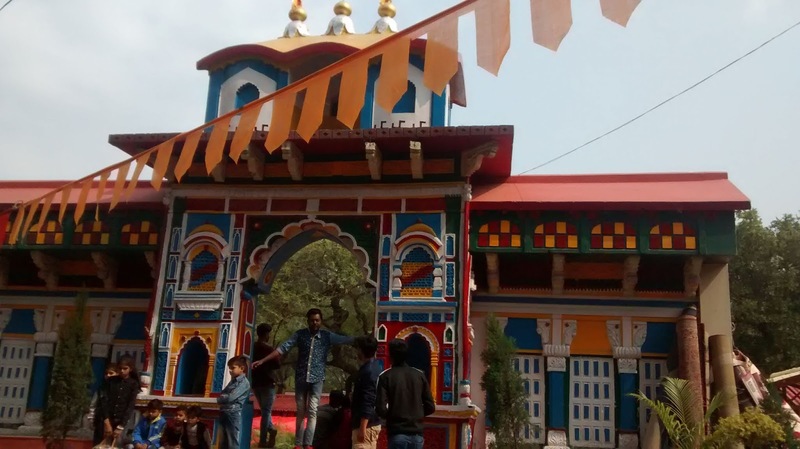 This is the 33rd edition of the fair and this year the duration of the fair has been increased by two days and is being held from 1st February to 17th February. 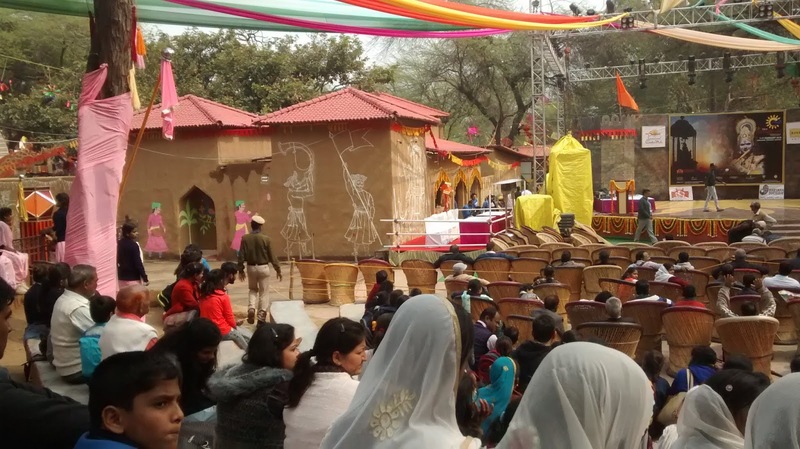 HISTORY OF SURAJKUND - The name Surajkund means reservoir or pond of sun. 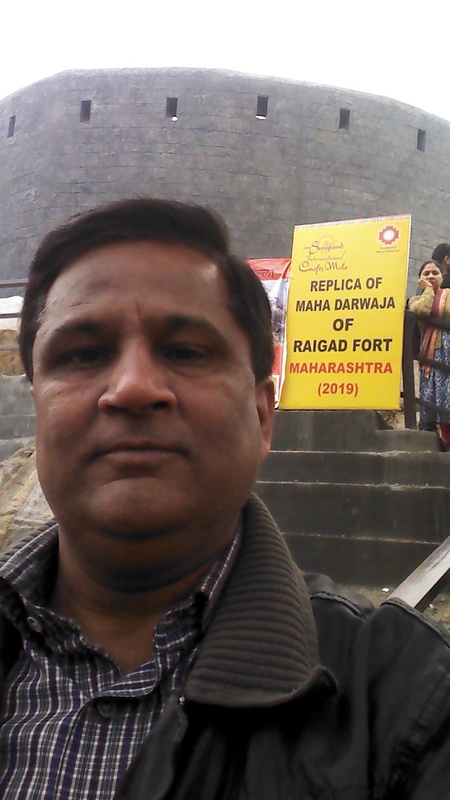 King Surajpal of Tomar dynasty, who was the devotee of sun God, built the reservoir in 10th century. This explains the name. The embankment of the reservoir has an amphitheater type shape with steps. People can sit there and enjoy the view. It is built in an arc which is as per the direction of movement of sun i.e. east to west. THE FAIR - Surajkund International Crafts Fair was started in the year 1986 by the government of Haryana state, adjacent to Delhi. The fair complex is spread over an area of more than 40 acres. 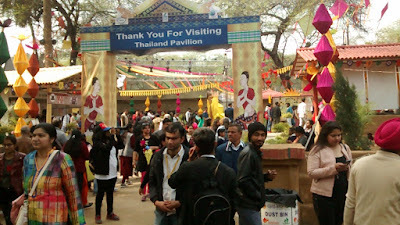 Every edition of the fair has a theme state from India and a partner country. 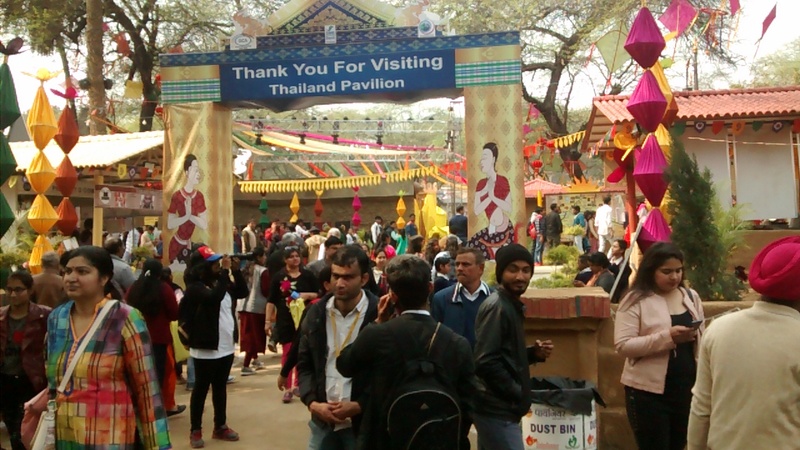 This year Maharashtra from western India is the theme state and Thailand is the partner country. 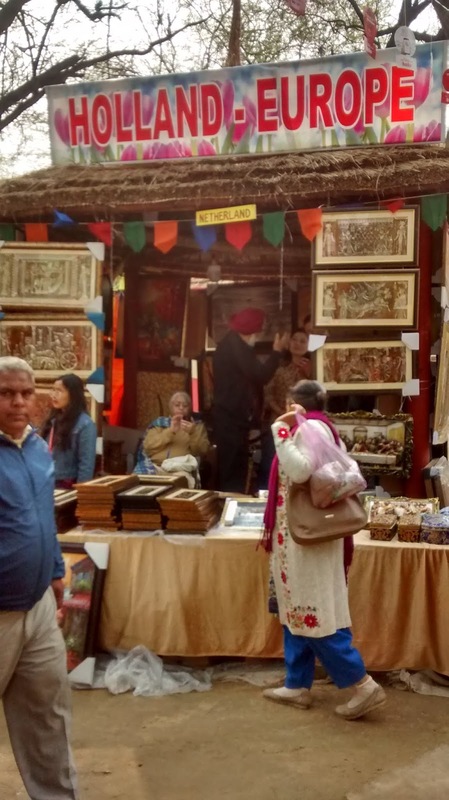 More than 1100 craftsmen from India and 20 other countries are participating in the Surajkund International Crafts fair this year. 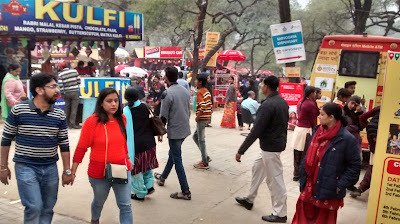 The fair is organized in a rural ambiance. Stalls are designed in hut style with mud platforms to display wares and thatched roofs to cover them. This gives a distinct identity to the fair and brings to the fore, rich Indian cultural traditions. 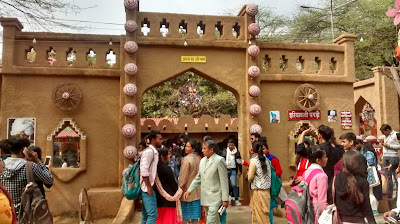 Surajkund International Crafts Fair is a confluence of crafts and diverse cultures of different Indian states as well as the participating countries. 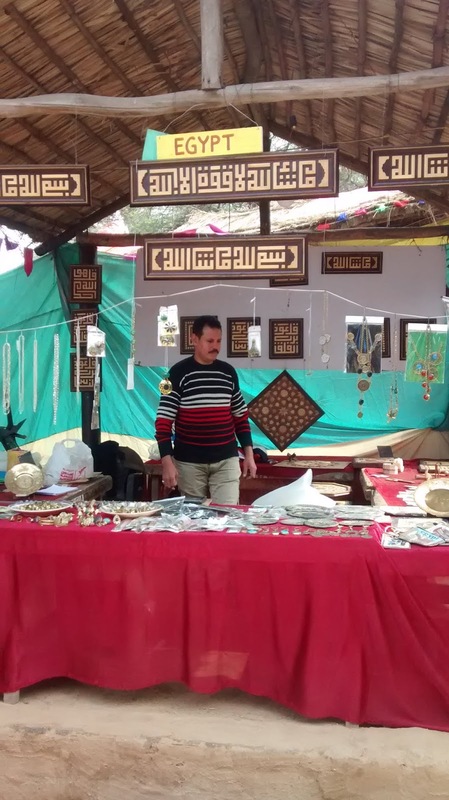 The local and ethnic craftsmen get a platform to showcase their skills and enhance their businesses. 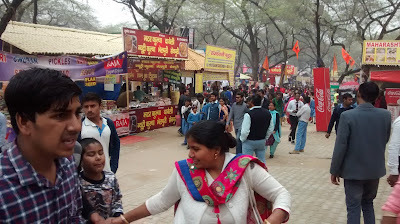 The fair or mela(in Hindi), is visited by more than one million people during the period in which it is held, from India as well as abroad. 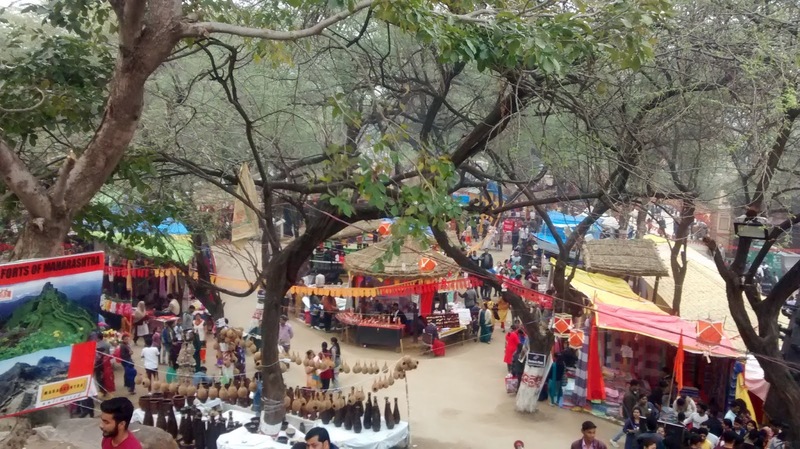 When I went to visit Surajkund International Crafts Fair, the venue was jam packed. People from all sections of society could be seen there, mingling and enjoying the colorful extravaganza. 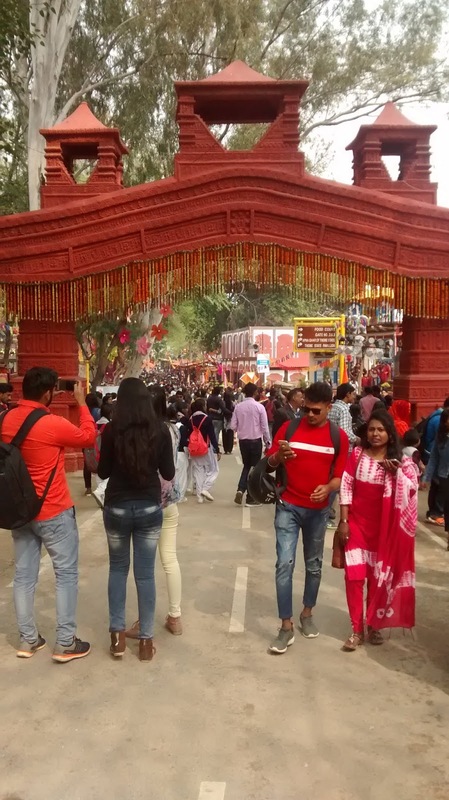 Students, families, businessmen, villagers, foreign tourists, all could be seen basking in the winter sun in the open and excitedly walking through the celebration of crafts and cultures, that is Surajkund Mela. 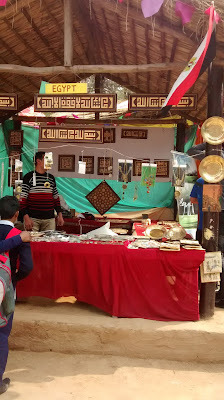 I could see people of all ages getting amazed by the crafts displayed at the fair.People were dancing to the beats of local bands. It was a riot of colors all around. FOOD - There is a separate food court in the fair. This food court has stalls offering delicacies of different Indian states. You can relish Chole Bhature of Delhi, or a Rajasthani Thali, Jeleba and Tandoori tea, Vada Pao and Pao Bhaji from Maharashtra or Dosa, Vada from south India or a Punjabi thali and much more. ENTERTAINMENT - There is a Chaupal (an open air theater) to enthrall you with cultural presentations by troupes from India as well as foreign nations. 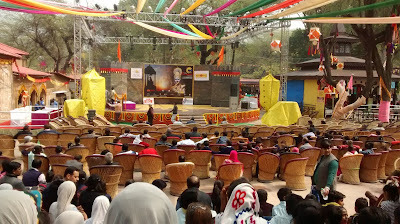 There are programs during the day and special presentations every evening. 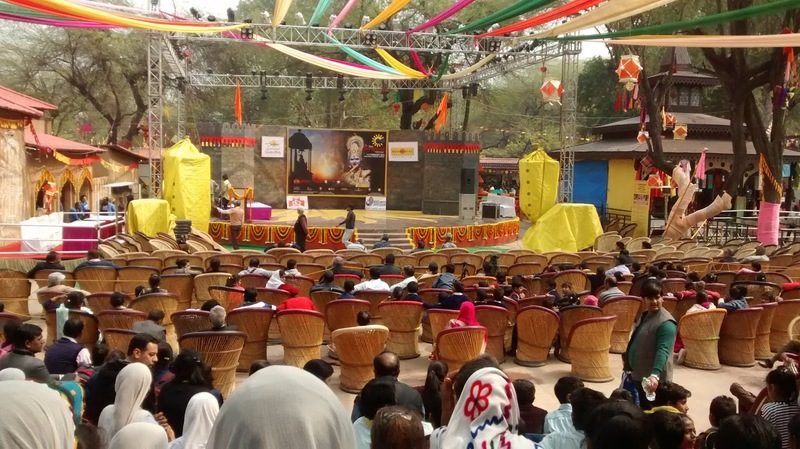 Many renowned artistes give performances at the chaupal every evening from 6 pm onward. 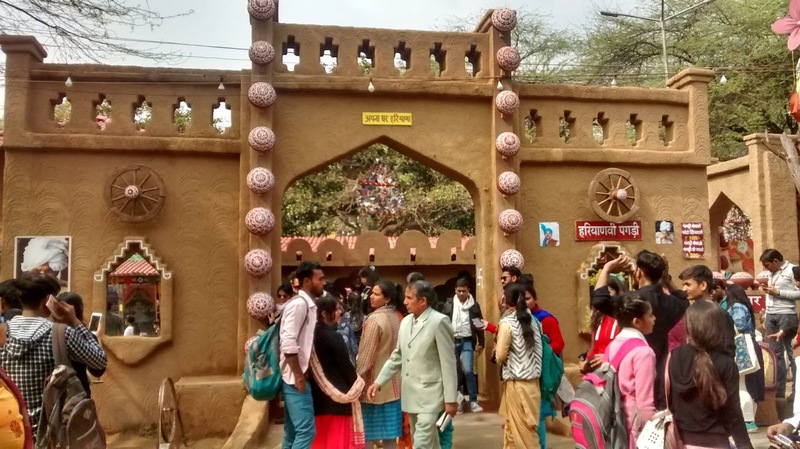 A separate and special area is available for amusement and adventure activities. 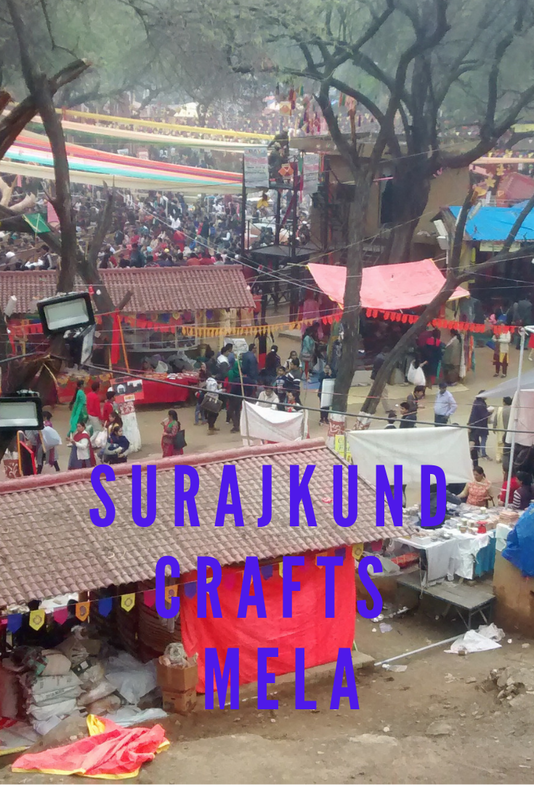 Surajkund International Crafts Fair holds it's own place in the international events calendar and brings together, the crafts and cultures of different and diverse places. 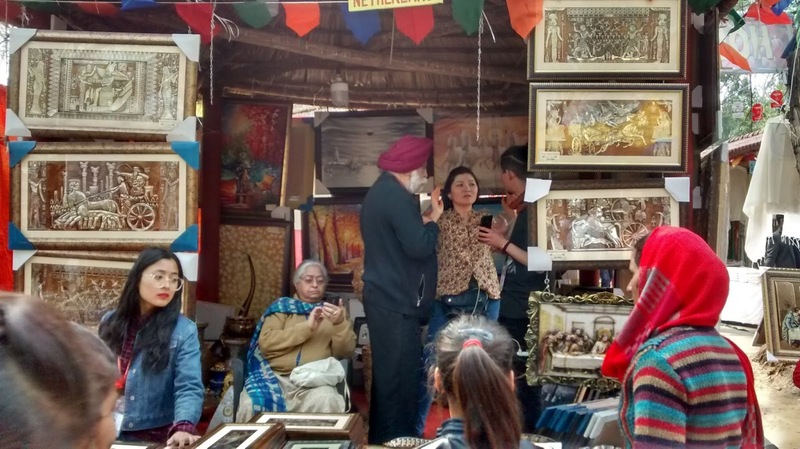 Do not miss this fair or you would be missing viewing the largest amalgamation of different cultures as well as the richness of India's craftsmanship. Hello friends! 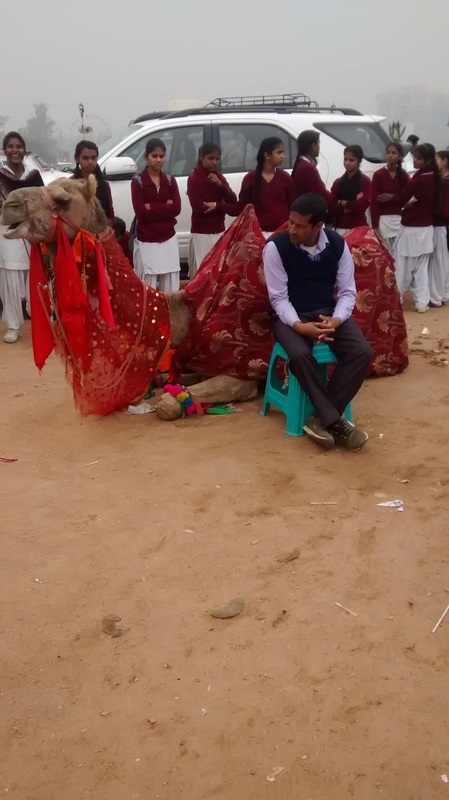 There are so many amazing places to see in India. What kind of places to travel do you like? 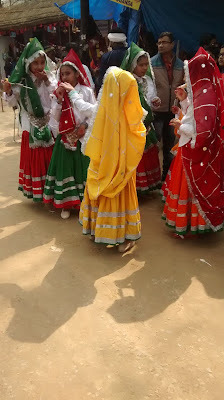 I know, most of you will raise your hands if I asked about your love for traveling to hills. 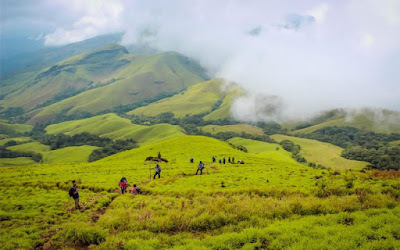 Kudremukh in Chikkamagaluru district of Karnataka in south India is a small hill station which is also an amazing trekking site and is a place to travel for those seeking natural beauty and adventure at the same time. Meaning 'horse face' in local Kannada language, it is the second highest peak of Karnataka. 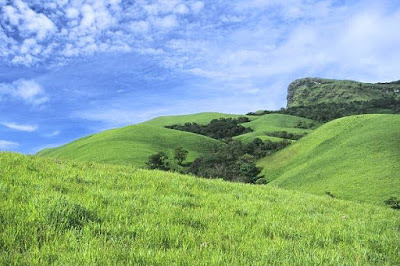 Kudremukh is called so because of a peak here that looks like face of a horse. Kudremukh is a part of the western Ghats and has a wealth of bio diversity and minerals. 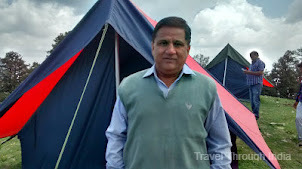 One of the most amazing places to see in India, it is a perfect location for trekkers and nature lovers alike. The charisma of the place lies in the lush green meadows all around. 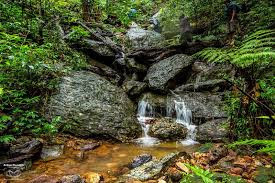 Surrounded by dense forests, Kudremukh is blessed with rare varieties of orchids and rivers. There are so many amazing places to see in and around Kudremukh that it is difficult to write about each one of them. However, I have tried to bring to you, some of the most important and sought after places to visit in Kudremukh. 1. KUDREMUKH NATIONAL PARK - Spread over an area of 600 square km, this is the secong largest protected wildlife park. Kudremukh national park is set in the midst of mountains and has a mesmerizing scenic beauty. 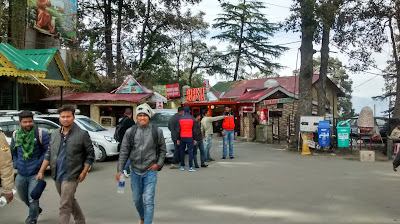 Granted the status of national park in the year 1987, this is one of the most well maintained national parks. Adorned with natural beauty, it has a variety of flora and fauna. It is also home to various endangered species of plants and animals. Kudremukh national park is a natural habitat of many animals like Sambhar, Giant squirrel, spotted deer, common langur etc. 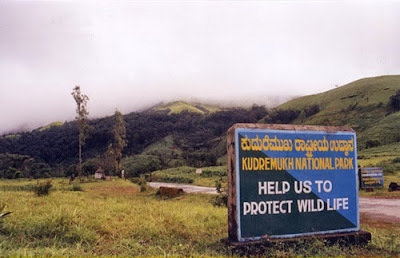 Endangered species like tigers, leopards and wild dogs can also be found in Kudremukh National Park. 2. GANGAMOOLA - Considered to be the source of three rivers namely Tunga, Bhadra and Nethravati, Situated at an altitude of 1460 m, this is also known as Varaha Parvatha. Gangamoola is a UNESCO world heritage site. 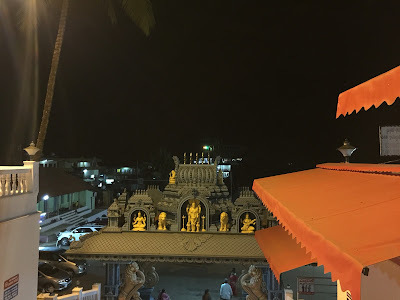 Temple of Goddess Bhagawathi is a major attraction here. 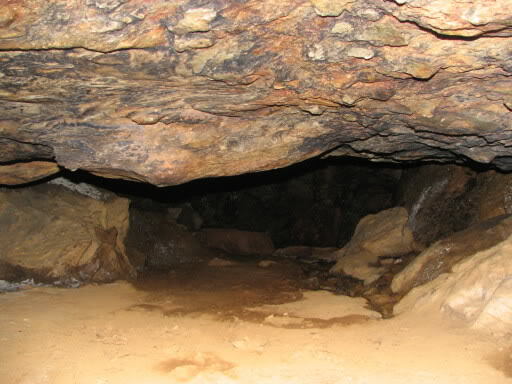 A Lord Varaha temple is located in a cave, from where one of the river originates, with a 6 feet tall idol. 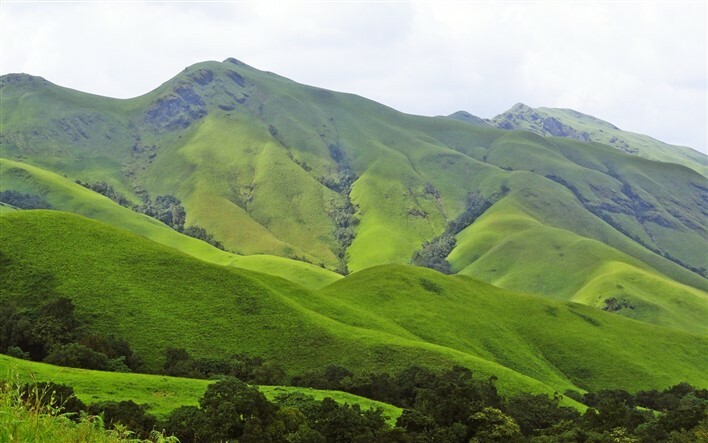 Gangamoola is located within the limits of Kudremukh National Park. 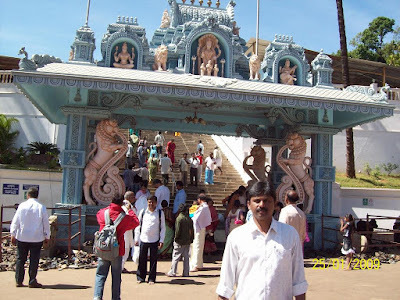 You will have to trek for about 2 km from the road between Sringeri and Kudremukh to reach Gangamoola. 3. KALASA - Just 8 km from Kudremukh is beautiful Kalasa town, situated on the banks of river Bhadra. Kalasa means pot. This beautiful town in Chikamagaluru district is known for Sri Kalasheswara temple, dedicated to Lord Shiva. Kalasa is believed to have come into existence during Lord Shiva's marriage to Parvati. The temple showcases the architectural heritage of south India and has different designs. 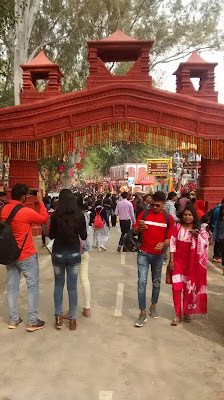 It is visited by a large number of pilgrims. 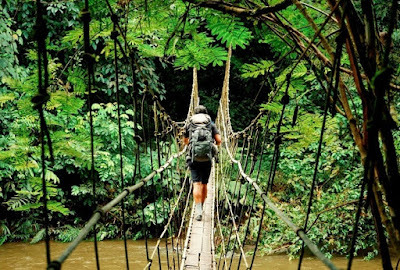 Kalasa is surrounded by rainforest and is any nature lover's delight. 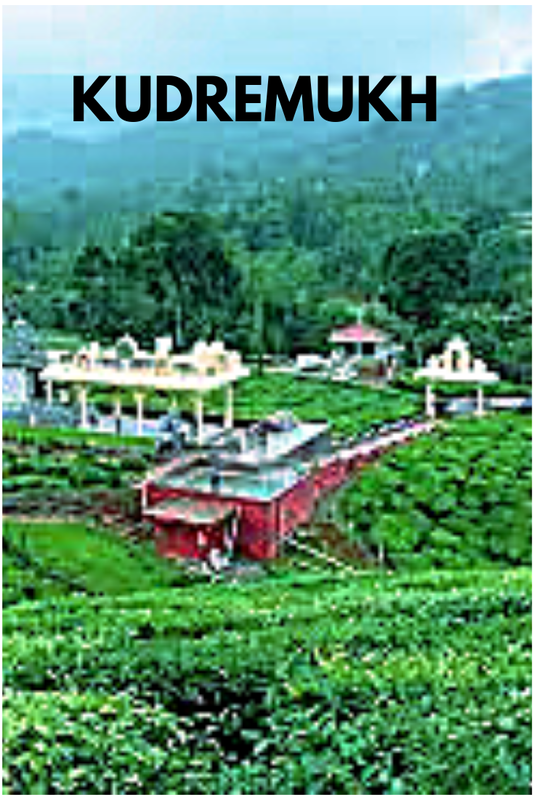 Kalasa town boasts of sprawling coffee and ayurveda gardens. Do not miss to see this beautiful place. 4. 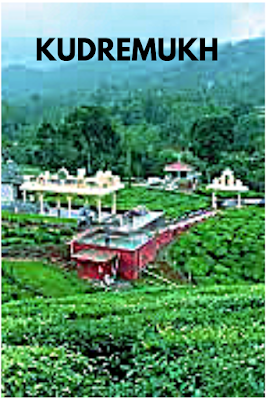 HORANADU - A small quiet village about 17 km from Kudremukh, Horanadu has pristine natural beauty. 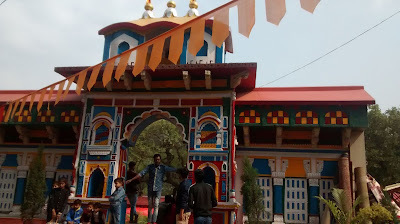 It has temple of Adi Shaktyamaka Annapoorneshwaridevi. The statue of the deity is made of pure gold. 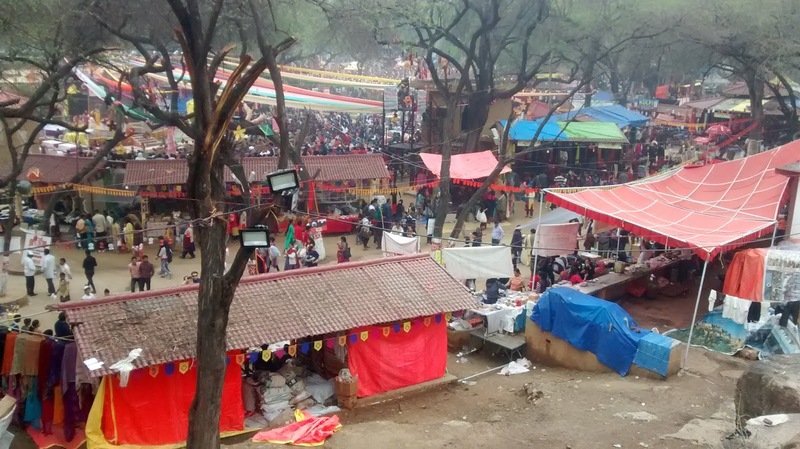 It is believed that devotees, who visit this temple, never face shortage of food. The area is full of tea, coffee and spices plantations. You can buy these items in bulk from here. The prices are much lower than those in the cities. The scenic beauty of Hornadu is itself a reason to pay a visit. 5. TREKKING - First thing first. 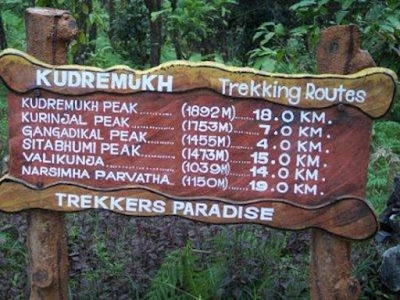 You will need permission from the forest department for trekking in Kudremukh. At an altitude of 1900 m, Kudremukh offers variety of trekking trails according to level of difficulty. Of all the treks here, Kudremukh trek is most exciting due to it's flora and fauna. The excitement lies in the myriad landscapes on the route. 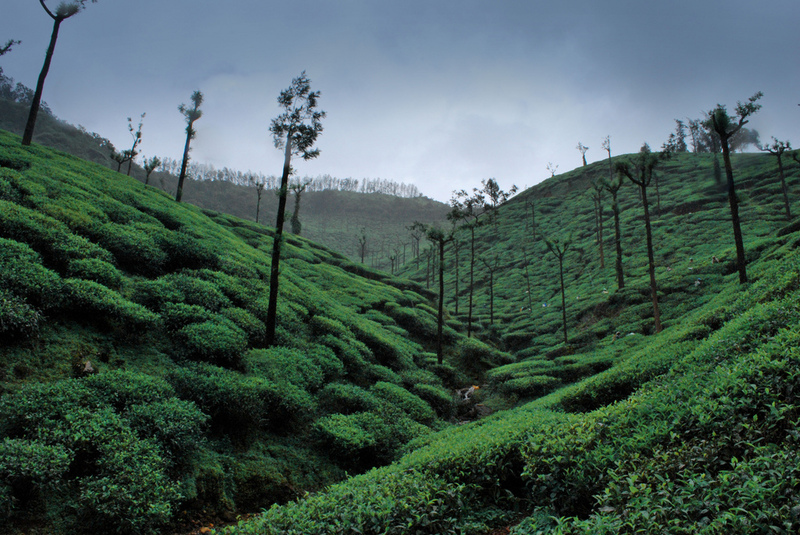 The bamboo shrubs, rolling hills, water streams and rolling hills, all make this trek a memorable one. The trek is nearly 20 km long and covers tropical green forests and coffee farms. The view from the top of Kudremukh peak is breathtaking. You get an amazing view of the Arabian sea and varied landscapes from the top. AIR - The nearest airport is Mangalore which is about 130 km away. 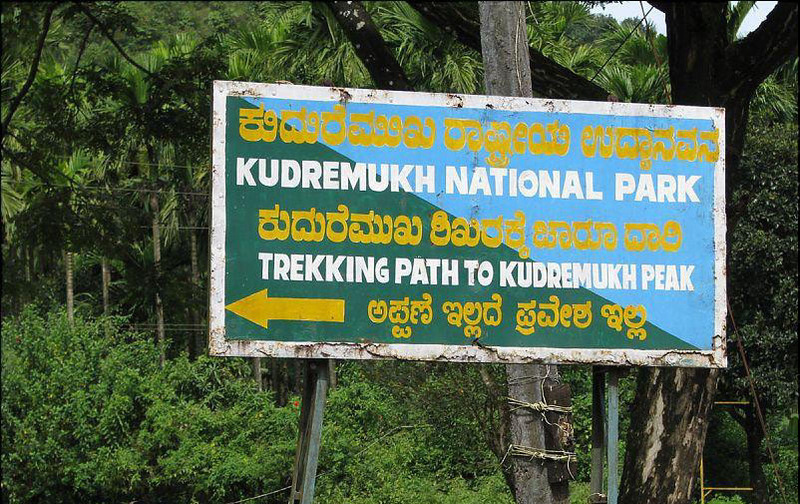 You can take a taxi or bus from here to reach Kudremukh. TRAIN - The nearest rail station is again Mangalore. 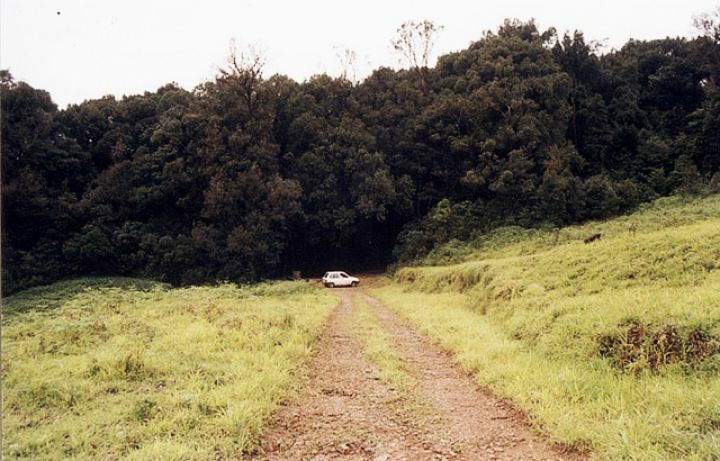 ROAD - Kudremukh is well connected by road with major cities of Karnataka. You can get state run buses including AC and non AC buses to reach Kudremukh. 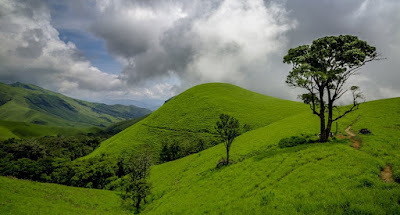 Kudremukh is one of the most amazing places to see in India. Do not miss a chance to visit this place full of natural beauty.